Getty Images: A Home Depot store in Miami, Florida. Certain additional expenses and the bonus payments will negatively impact Home Depot's fiscal 2017 earnings. Home Depot is still evaluating how new tax legislation will impact the business in fiscal 2018, but said it should be "beneficial." The bonus amounts will be determined based on a person's length of service, similar to Walmart's strategy. 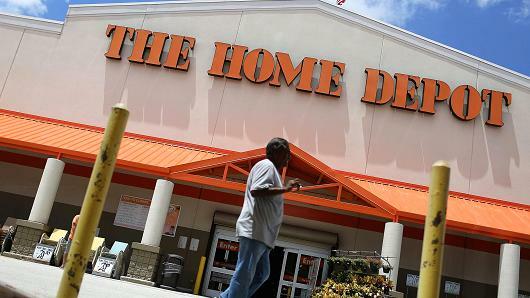 All of Home Depot's U.S. hourly workers will get at least a $200 bonus, a spokeswoman told CNBC, and the maximum payout is $1,000 for workers who've served at least 20 years. Home Depot declined to comment on these amounts. Home Depot joins a growing list of corporations, and many retailers, using new tax benefits to invest in their workers. For fiscal 2018, Home Depot is still evaluating the legislation's impact on its business, but said it should be "beneficial." "Amid the changing retail environment," Home Depot said it plans to make more investments in its stores, workers and the customer shopping experience. More companies, and especially retailers, face heightened pressure today to recruit the best talent as the U.S. labor market continues to tighten. Bonus payments, wage increases and other benefits can help incentivize current employees to stick around. Home Depot will provide more details on future investments when it reports fourth-quarter earnings on Feb. 20.